Michaela Atanassova in Gaming Lifestyle Uncategorized on 22 February, 2018. 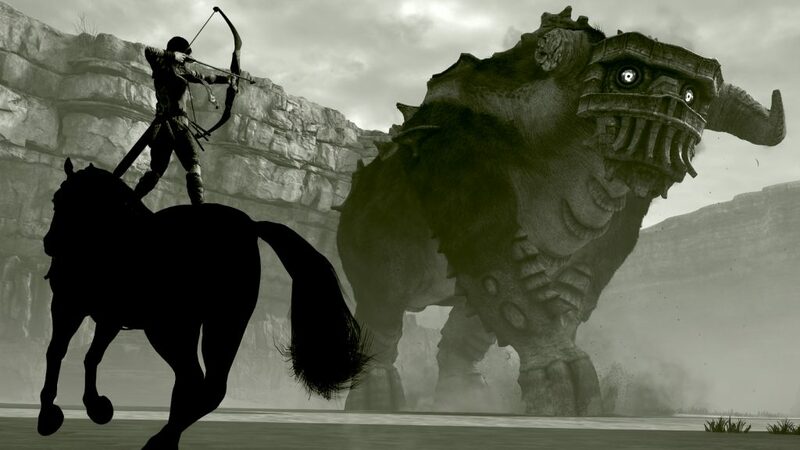 It has been more than 10 years since the original Shadow of the Colossus came out for Playstation 2 in 2005. The game has been remade from the ground up but has retained its core gameplay with the difference in console controls schemes, performance and graphics. The main reason why it beats most of the competition is the preserved magical atmosphere, awe and inventiveness in large scale of spectacular scenery, ferocius beasts and profound evocative emotions. It sustains the inner conflict in the player of what is presented and what is felt during the adventure. The improved overall experience is targeted at the new generation of gamers while it introduces the initial spirit of the game that made it a classic in the burgeoning exploration adventure genre. The remake presents a substantially enhanced graphics design where the intricate details set the trend of extremely reaslitically immersive environment: shades of sunlight through clouds, lush branches or dead silent valleys creates the desired effect of the epic fairytale. The story is the same where a character the Wanderer needs to resurrect a maiden girl Mono and he goes through great lengths to attain his goal like destroying colossi in a forbidden land to give power to a shaman to execute a ritual. 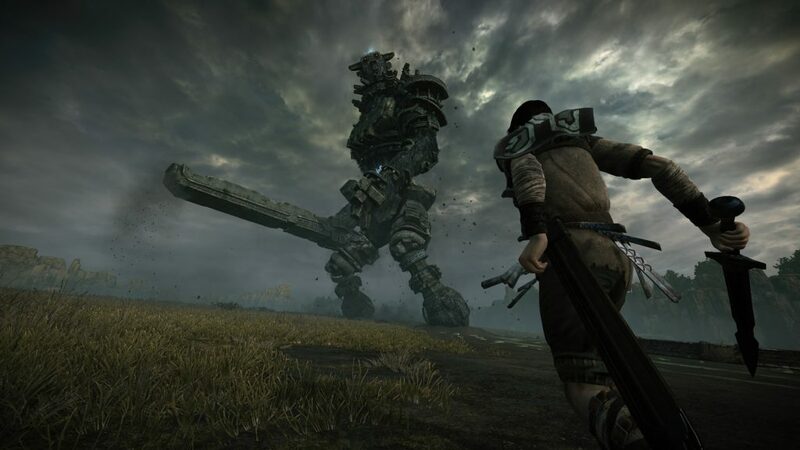 Every colossus has a weakness and the player should solve it like a puzzle in order to slay it successfully. The epic tale is reminiscent of myths and legends about heroes where nothing specific is known about the protagonist and the hero has to complete set of tasks to complete his quest or go through some kind of personal challenges as described by Joseph Campbell’s “The hero with a thousand faces“. The emptiness in the world gives the chills of the importance of the quest and the possible grim emotions of the character that drive him to do what is necessary to accompish it, how he loses part of himslef after killing beast after beast by giving a gripping brutal story. It is the total opposite of conventional exploration games where the worlds are colourful and exciting, that feel alive with the tons of living creatures and where the joy of hunting and slaying has been dimmed down a little just by the overwhelming quantity rather than quality. 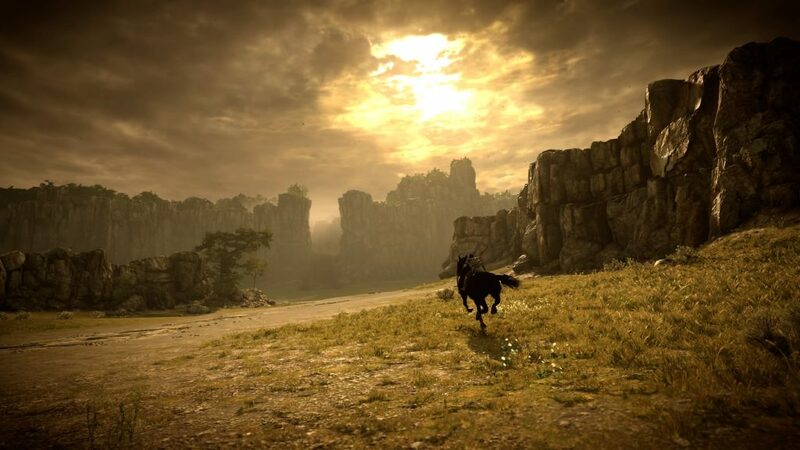 The Shadow of the Colossus effectively makes the player care about the journey of the character and the nature of the beasts because of their own special traits and behaviour. Even your horse Argo still has its tricky navigation as during high-speed ride taking turns is somewhat frustrating but its horse temper is still quite as entertaining. The newly inserted gameplay features in the game are earning game-changing items like masks after you complete a challenge or a time trial which usually should sustain your interest after the first playthrough. Nice addition is autosaving, revamp of the locations of the colossi in the map and the existence of healing shrines. Moreover, the photo mode gives you the opportunity to save the beauty of the game with plethora of camera options for light FX filters, positioning and vignette intensity. It is tempting especially during battle with a colossus to go into camera mode and just capture emotions of the tale like a travel journalist. The quiet long ride to battle colossi asks some controversial philosophical questions that set it apart as weird project from the rival RPG games. The new graphics give it some unrecognisable warmth and keep its core, it stirs the question of how much visuals are needed to capture the initial magic of the original and what lies ahead for the game industry. Is successful contemporary game development entirely dependent on the sheer need of as much striking visuals as possible or is the minimal core of a story timeless (George Lucas)? The example of the two games gives an interesting view of the cyclical medium in the gaming industry and how to preserve games in the right way – how some old simplistic design is still enduring, even recognised as new. Recently game developers have pushed the boundaries of some franchises by developing sequels, reboots, remakes that promise vast gameplay improvements but in the end just bombarde us with endless quests, item purchases, confusing character skill trees and exotic worlds that are supposed to awe us. As most expereinced gamers after a time all the minmaps, health bars, help prompts, magic spells, potion making just numb the senses to dynamics and make the experience of exploration repetitive by setting a virtual world that dulls the significance of almost every moment – after a time you do not care that much about those details because they become like a mandatory chore. The success of the Shadow the Colossus lies in its ability to make every moment of gameplay count by not overcrowding your senses. The core footage that does not give you all the navigation accessories and does not require you to have hoarded inventory gives a more in-depth exploration. It is analogical to playing The Witcher 3: Wild Hunt without the help of minimaps, health bars or magic buttons – the experience becomes exceptionally immersive and unusually more difficult because you need to pay more attention to the environment as an enemy may attack you from a hidden spot or as you need be aware of your health after every hit. However, The Shadow of the Colossus you have one goal in a solemn, lonely world which is a breath of fresh air as you do not have all the in-app purchases or side-quests that you need to complete to build the utmostly destructable killing machine. It gives you a break from all the marketing within games, all the different violent controversial stories by presenting you minimum set of characters with minimum set of creatures in a vast unknown calm yet dangerous world that actually evokes deep emotion. It is not the ultimate epic journey of defeating evil bad guys who are involved in some confusing conspiracy intrigues or slaying exotic creatures for the sake of item craft. The game is a reference to the old myths that have simplistic storytelling with a hero on a quest to do or experience something that causes him to suffer but reemerge newly reborn in the end. The developers have restored the source text by keeping the interior preserved but enhanced which is different from most classic remakes that build on the exterior. Analogical to language translation the integrity of the author’s text is untouched as it is the responsibility of the translator to capture meaning of the text with different language techniques. That is why this acclaimed remake gives a direction for the entertainment industry how to properly present the core of the source material to new generations and how to preserve it with simplicity that worryingly is considered new in the current technological landscape.